Well, it’s officially frigid here and all I want to make for dinner is soup. 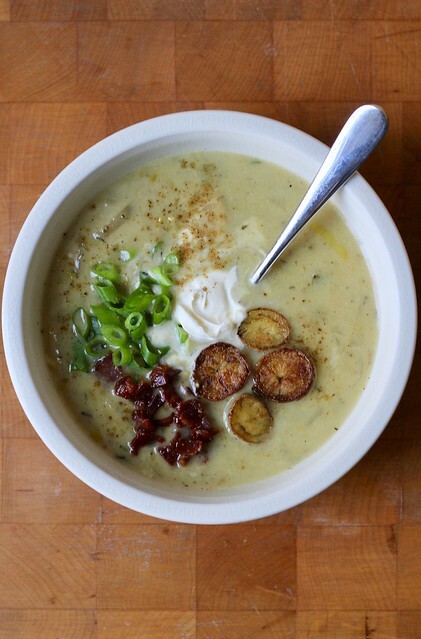 Luckily, Cook the Book Fridays picked Dorie’s Potato Chowder Lots of Ways for the recipe of the month. I like the “lots of ways” bit because it pretty much tells me I’ll have room to improvise, which I usually do anyway but having permission is a refreshing change. Hahaha. I actually didn’t really veer too far off base here, just a few tweaks and some flavoring and topping customization. This is really a potato and onion chowder, using just about every allium you can think of: yellow onions, leeks, shallots and garlic. Any not on this list can be added as a topping. I first pre-crisped some turkey bacon bits in my Dutch oven and set them aside for garnish. As the alliums cooked down all soft and sweet, I seasoned them with Old Bay. My dad used to have a boat on the Chesapeake, so I love that stuff. I never peel potatoes if I don’t have to, and didn’t see a reason to here, so I left the skins on mine. I don’t always love how I feel after eating soup with a cream base, so I skipped the cream here and instead stole a couple of ladlefuls of soup out of my pot (the liquid with some potatoes and onions) and whizzed it really smooth in my blender. I stirred that back into the soup to give the base a thicker, velvety texture and then added about 1/4 cup of 2% milk just to give it a slightly lighter, more chowdery, color. Because I’d been restrained with the dairy in the soup, I felt no guilt when adding a blop of crème fraîche as a topping. Also on top of the “my way” chowder, I sprinkled those bacon bits, some sliced scallion and some tiny potatoes that I crisped up in olive oil, crouton-style. Delicious. I will definitely try this chowder other ways as the season goes on. For the recipe, see Everyday Dorie by Dorie Greenspan, and head over to Cook the Book Fridays to see how the group liked this one. That is a delicious looking soup, and wasn’t it good? I am anxious to try the other versions of Dorie”s chowder. It is always nice to have the “permission” to play around. 😉 I like the idea of whizzing some of the soup in the blender and adding it back in for the texture. You photo is lovely as always! Your soup looks delicious! Pureeing some of the soup is a great idea! I love your addition of the tiny crqispy potatoes as part of your garnish, such a pretty bowl of chowder you have there! That soup is GORGEOUS! Love how creamy it looks even with not too much milk in there! I also loved that we were basically given carte blanche to make it however we please! Your soup is so beautiful! I also thought about taking some of the soup out and blitzing it but I was too lazy haha! I will do this next time though – love the creaminess of yours! Your improvisations make a lot of sense to me. More than that, I can feel the love you put into the chowder. Well done! Lots of good ideas and your soup looks delicious! Liked your crispy potato slices on top as well as your substituting soup liquid and milk whipped together to make it more “chowdery.” Liked that Dorie just gave us a basic recipe of potatoes and alliums and then left us to go wild. We all seemed to have our take on this chowder and yours looks especially tasty.